1. 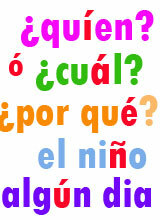 What is the word for question in Spanish? 2. How do you say who in Spanish? 3. How do you say why in Spanish? 4. How do you say when in Spanish? 5. How do you say where in Spanish? 6. How do you say which in Spanish? 7. What is the word for what in Spanish? 8. What is the word for how in Spanish? 9. How do you ask how much in Spanish? 10. How do you say whose in Spanish?